鸡年快乐 “Ji Nian Kuai Le” Happy Chicken Year! 新年快乐！Xin nian kuai le! Happy New Year! I hope you all had a wonderful Western New Years Eve and Day. We spent New Years Eve at a fancy hotel here with some good friends. 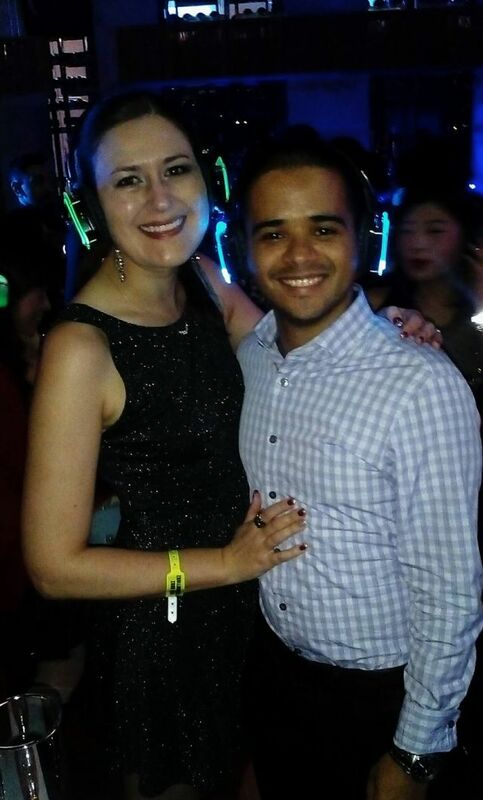 Amaury and I ended up dancing ourselves to exhaustion, so I’d say it was a successful evening. 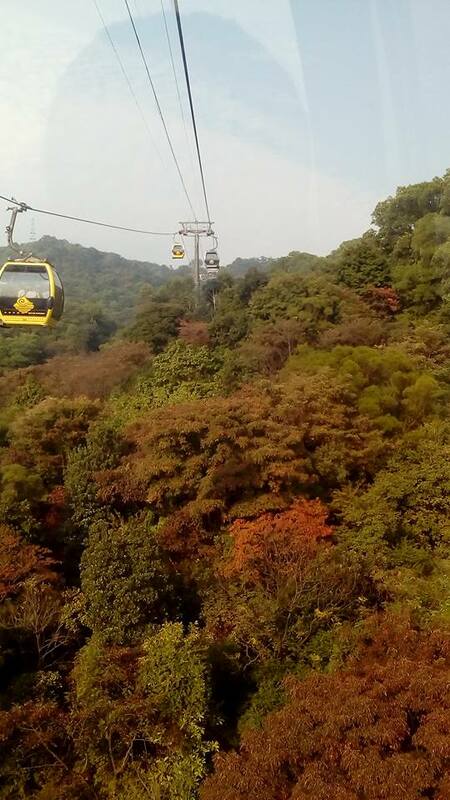 Some of you may remember back to my very first post when I shared info about Guangzhou and a picture of the cable car ride up to Baiyun Shan, the mountain in Guangzhou. Well after six months, we finally made it up the mountain on New Years Day along with several thousand other people. It was quite busy, but the view from the cable car, after waiting for an hour and a half in the line that seemed to never end, was worth it. I wanted to escape the pollution, the crowds, and the concrete of the city. I got 2/3 so it was a pretty wonderful afternoon, and it felt so good to be surrounded by wild trees. 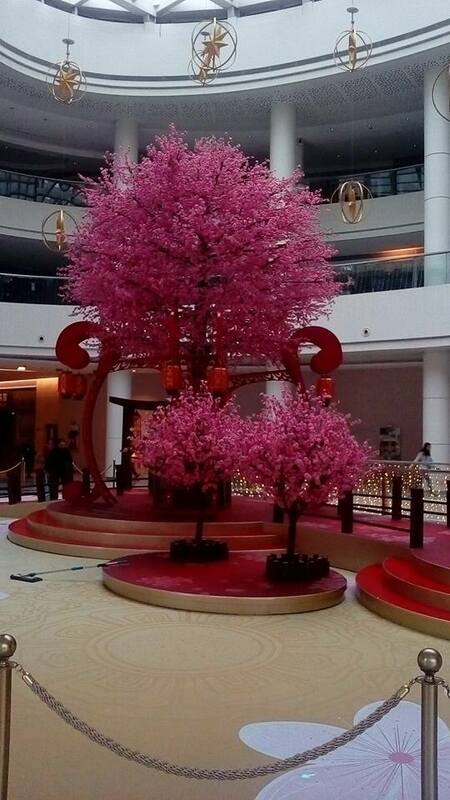 The holiday season is only just beginning here in China as everyone prepares for the upcoming Chinese New Year aka Spring Festival (chun jie). All the Christmas and Western New Year decorations have been replaced by red, gold, and roosters as it’s 鸡年 “ji nian” (year of the rooster/chicken). Chinese New Year officially starts on January 27, but life here is already slowing down and people are leaving town. It is exciting to experience this major Chinese holiday, and we’re looking forward to a quiet staycation in Guangzhou. Apparently, Guangzhou has beautiful flower festivals at this time of year and it’s a good time to explore the city while a large chunk of its population travels to spend the holiday with family. While the Chinese national days in October are a chance for Chinese people to explore China, New Year is traditionally a time to be with family and my Chinese friends have plans to head back to see their parents. Ex-pats also take advantage of the time off to travel outside of China and so our community here will contract for a couple weeks as people leave. Of course, on our Western calendar we are already well into 2017, so Amaury and I have been throwing ourselves into our New Year’s Resolutions. Neither of us spend a lot of time thinking those up… usually our resolutions are extensions of goals we already have and we use the new year to affirm them. His is to get into “the best shape of his life,” so he has been regularly cycling and joined a jiujitsu class. For three years now, we have done “Yoga with Adriene’s” 31 day yoga challenge. It’s such a good way to start the year and refresh with some new ideas. I’ve been amazed this time around with how much stronger my core is- it feels like a metaphor for my life lately. I’ve been feeling particularly grounded and centered in my life here. Of course on a daily basis ex-pat life throws uncertainty and confusion into the mix, but lately, I’ve been feeling relatively well-balanced. Being overseas (and I would argue, moving to a new city) is a great opportunity to try new things, meet new people, and get involved, because you really have to create your community from scratch. For a long while, I’ve missed playing trumpet, so I’ve been actively working to join groups and practice regularly. I’ve really loved being in choir and through those groups have met more musicians. 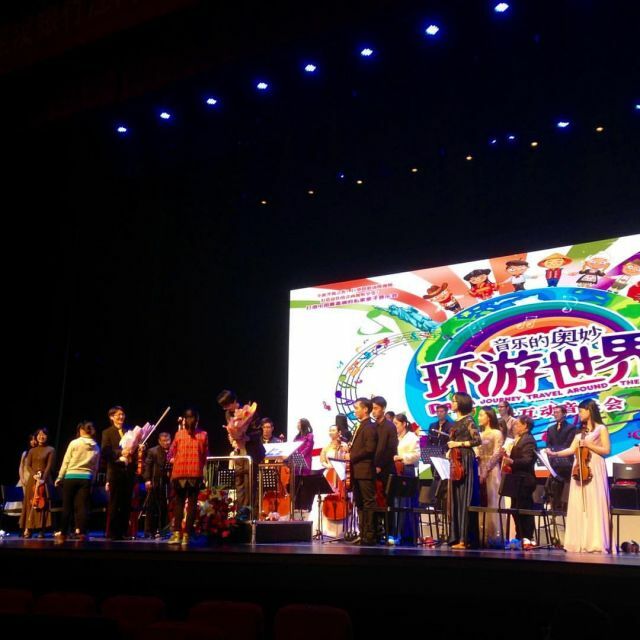 My friend J recently encouraged me to join the Guangzhou Baroque Orchestra and introduced me to their conductor. Nervous doesn’t even begin to describe the collective feeling of nerves, terror, excitement, self-doubt, self-esteem, and courage that I experienced joining this group. I was severely out of practice, so have been practicing daily for over a month. Music is unforgiving- there’s a quote about regular practice from someone sometime that goes “If I miss one day, I notice. If I miss two days, the conductor notices. If I miss three days, the audience notices.” I’m definitely not back to where I used to be, but I finally felt able to send an audition tape to the conductor and was so relieved when he invited me to join. I think it was a particularly good time to join, because they’re in a bit of lull between the holidays. I went to my first rehearsal this past Saturday. I already knew I’d be the only trumpet player, but I didn’t realize that they currently have no brass players at all and that the wind section is made up of three flute players. Otherwise, they had a pretty solid and high-quality chamber orchestra. As they were preparing for a concert the following day, we didn’t rehearse too much and just ran through the pieces we’d be playing at the concert. I quickly realized that there was actually a significant need for trumpet in many of the pieces. So I ended up soloing quite a lot, though fortunately already knew most of the music because we were playing excerpts from famous pieces for a children’s concert. The conductor is such a talented and nice guy, he really set me at my ease and made me feel not only included but that I really couldn’t fail. He was just happy to have me there, anything else was a bonus. I ended up having a great time at rehearsal. The coolest part was that most of the rehearsal was in Mandarin with Cantonese and English thrown in- while I certainly couldn’t understand everything, I was able to follow along to everyone’s great relief. I’ve recently realized that Chinese people here are very inclusive but actually get nervous when it comes to having non-Chinese speakers present because they are worried about communication issues. So it was really good that I was able to fake it a lot and follow along, because it set everyone at ease and then we could all just play together. My dad, who is a prolific and gifted trombonist, taught me that if you play music you can make friends anywhere. It’s so true and I’m so thankful I was able to learn music as a child. Though recently, I’ve also learned that you can do the same with the arts in general- I’ve also made new friends here through singing and dance, so being able to play an instrument is icing on the cake. 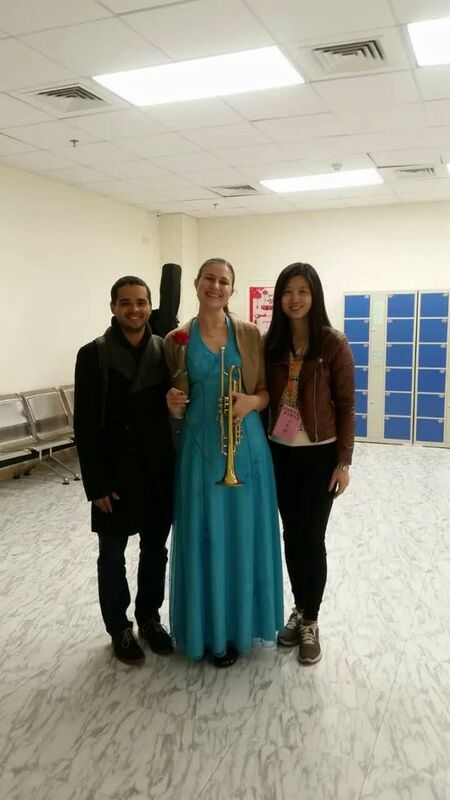 Yesterday, Amaury joined me on the orchestra’s trip to Jiangmen for our concert. Having only just joined the day before, I didn’t know what to expect, but the concert turned out to be extremely well organized. Apparently, people paid up to $50 a seat to attend and the theater was filled with families. The program was designed as a trip around the world starting with China and then traveling through Russia, Turkey, Austria, Germany, Poland, Norway, England, the U.S. (well kind of, we played a Star Wars medley), Japan, and Korea. 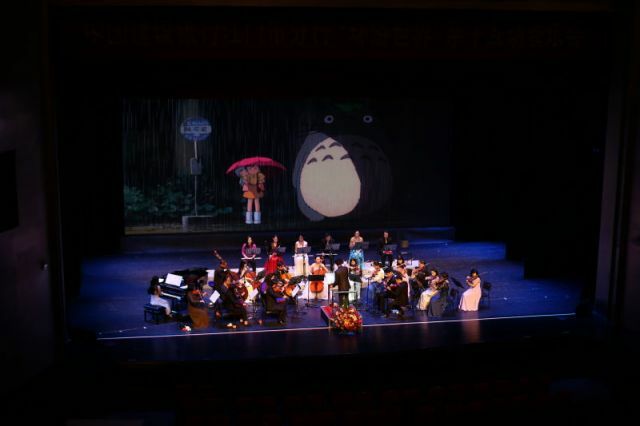 While we played, videos were projected onto a large screen behind us with scenes from those countries or from movies (Harry Potter, Star Wars, and My Neighbour Totoro). In between each piece the conductor taught the children about the countries, our instruments, conducting, and even invited a couple little girls to the stage to conduct during a couple pieces. At the end, we threw cute stuffed animals from the stage. The only downside was that the entire theater was freezing and as the women performers were wearing evening gowns with just shoulder wraps, we were shivering. I haven’t ever been that cold in China; I kept having to blow hot air on my fingers to keep them from going numb! Lunch and dinner were provided, so we got to try some really good Cantonese food. I never thought I’d say “really good” and “Cantonese food” in the same sentence- it’s not usually our favorite kind of Chinese food (except for dim sum- who doesn’t love dim sum?! ), as we find it under-seasoned. I think we just hadn’t had the good stuff though. Dinner was at a delicious seafood restaurant where the staff kept bringing out more and more dishes each time we thought for sure the meal was winding down. It was a super long, but rewarding day. I’m really excited to keep playing with the group and to hopefully improve every day. 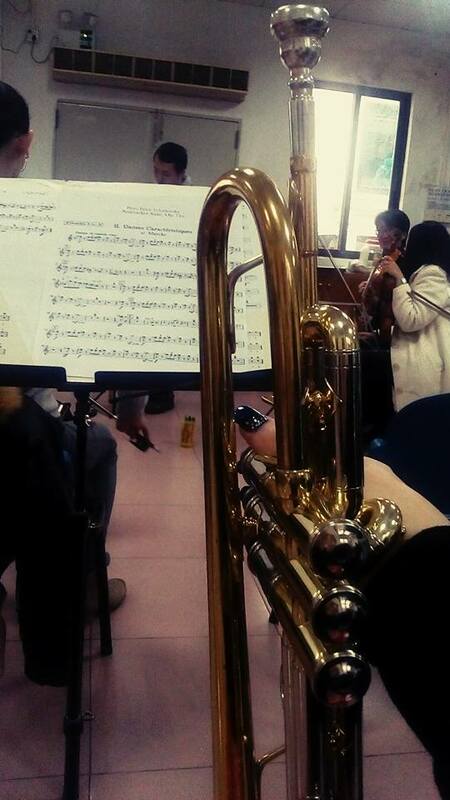 I’d really love to find a concert band or form a brass group, but for now, I am very happy just to be playing again. And a few days after the concert the conductor sent me 300RMB (~$43) for the concert. Apparently, we still had money left over after covering all the expenses, which makes this my first performance EVER where I individually earned money! Amaury’s birthday was this Tuesday, so I used the money plus my research earnings to buy us massages as part of his birthday week celebrations. Other birthday events this week included giving him birthday eve gifts, a tasty lunch at a Japanese restaurant with friends, homemade fish and chips, and tomorrow we’re having friends over for waffles. Lately, I’ve been missing home and my family, particularly during the holidays, but being in a place where every day opens up new opportunities and things to learn helps a lot. If I had a superpower, it would either be the ability 1) to speak any language or 2) to teleport anywhere at will. Not being able to do either those things makes me thankful for Guangzhou. It teaches me every day how to communicate with others and makes me appreciate my loved ones. On the eve of the U.S. inauguration, I am a mixed jumble of feelings. This New Year feels particularly new and uncertain, do you agree? My hope each day is for more communication and love in the world. And more activism. And a good dollop of social justice. And many other things besides. But, my main feeling as I enter this year is gratitude, so, for now, I will focus on that and hope to turn it into some wonderful things in 2017.